Endogenous digoxin has been related to hemispheric dominance. Right hemispheric dominant individuals were hyperdigoxinemic, left hemispheric dominant individuals were hypodigoxinemic and bihemispheric dominant individuals were normodigoxinemic. There is synthesis of digoxin by actinide based primitive organism like archaea with a mevalonate pathway and cholesterol catabolism. Ayurveda, the traditional Indian System of Medicine, deals with the theory of the three tridosha states (both physical and psychological): Vata, Pitta and Kapha. The tridosha states of Kapha, Pitta and Vata with hemispheric dominance and endogenous digoxin status. The Kapha state has been demonstrated as equivalent to right hemispheric dominant hyperdigoxinemic state. The Pitta state has been demonstrated as equivalent to the left hemispheric dominant hypodigoxinemic state. The Vata state has been demonstrated as equivalent to the bihemispheric dominant normodigoxinemic state. 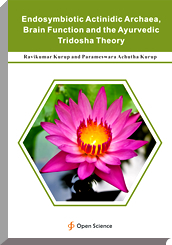 The actinidic archaea and viroids are related to the tridosha states of Ayurveda.